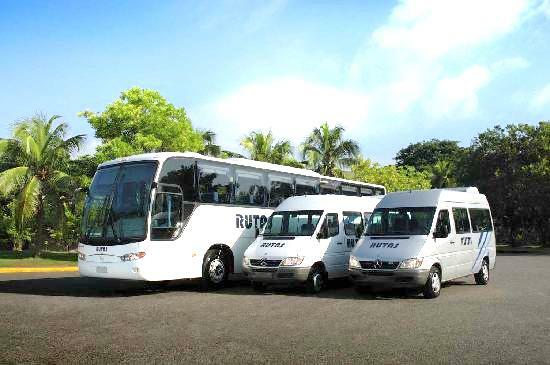 How to get around in Punta Cana. Taxis are available, but expensive Walking and taking taxis is a common, simple, and effective way of getting around Punta Cana. 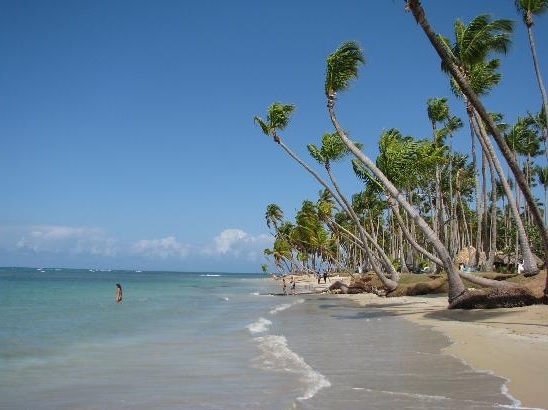 However, taking a car or bus inland will get you closer to the locals and "real" Dominican culture. You can also use motoconchos (motorcycle taxis) which are very cheap (US$2 to US$4 for most trips) and fast, but be warned: they can be risky. Always choose a motoconcho driver with an orange vest signifying membership in the local driver union, which requires qualifications. How safe is it on the roads. PLEASE NOTE that in the Dominican Republic reckless driving is extremely common and there is often little attention paid to other users and traffic. In a listing of deaths from traffic accidents, the statistics in the table below. 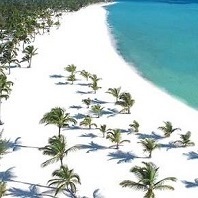 Punta Cana is largely comprised of beaches, such as (South to North) Juanillo beach, Punta Cana beach, Cabo engano, Cabeza de Toro beach, Bavaro beach, El Cortecito beach, Arena Gorda beach, Macao beach, Uvero Alto beach. You can wander between hotels via the beaches, either on foot or via the beach taxi. The nearest major town, Higuey, is about 45 minutes away by taxi. 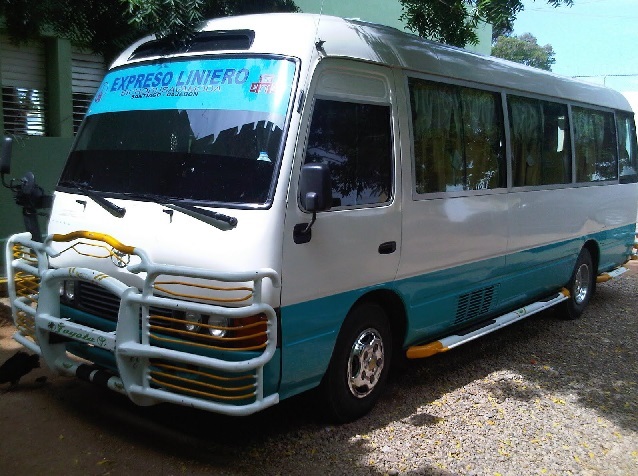 Obvious, if you are heading to the nearby restaurant or to the next beach, you can organize the travel yourself with one of the local transportation options. However if you plan to go further away, be sure you are confident. Small village Boca de Yuma If you want to leave your hotel or the area in which your hotel is situated, you can book many exciting, relaxing and interesting excursions which will ensure your safety as well as guaranteeing that you leave little impact on the area that you are visiting as well. See the excursions tab for more ideas on having a safe and still adventurous vacation. 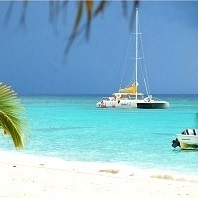 Most excursions will pick you up and drop you off at your resort, with transfers included in the price. 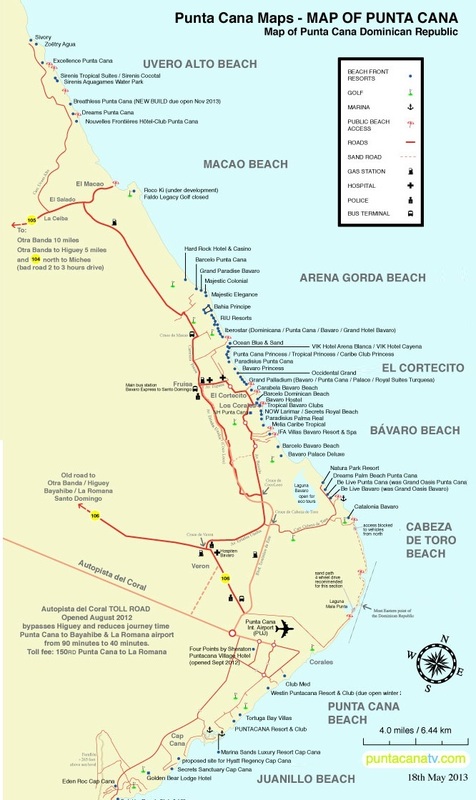 This map is courtesy of PuntaCanaTV.com.